The rise and rise of the night shoot has been well documented on UKAR - ever since RAF Northolt popularised the concept back in January of 2009, they've sprung up at various airfields and museums throughout the UK and Europe, extending the 'airshow' season into the dark winter months and offering keen photographers a chance to get shots of aircraft under floodlights. North Weald joined the act in March of 2011 when the resident Gnat Team hosted a small event featuring a few of the based classic jets and Yaks, and in October the historic Essex airfield hosted a small army of photographers, tripods in hand, for another event under the cover of darkness that was dubbed the Halloween "Flight Night". 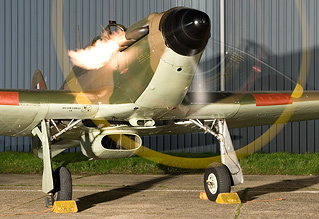 Dan Butcher spent an entertaining Saturday evening in the dark at North Weald. Additional photos from Steve Buckby. Organised on this occasion by Weald Aviation, aircraft participation was up quite a number on the earlier shoot, boasting a good selection of classic jets and a few warbirds too. It was the latter that really caught the imagination; flame spitting start-up procedures on the Venom and Vampire aside, there's not much on a jet aircraft at night that translates into a dramatic photograph. 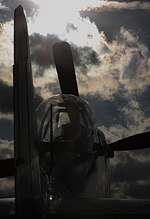 Warbirds on the other hand, with smokey and fiery start procedures and full disc propellers were an enticing proposition. It was a little frustrating therefore to have the Historic Aircraft Collection's Hurricane, visiting from Duxford, parked right up against the hangar wall while three broadly similar Jet Provosts occupied prime spots on the main apron, with a clear backdrop. With no permanent illuminations on the Weald Aviation ramp, temporary lighting was leased for the evening. 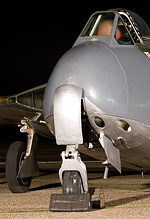 However, with only four generators on hand to power them, the aircraft went under the spotlights in pairs, the majority of them each given a static engine run; a format which allowed everyone the opportunity to see everything and get the shots they wanted before attention switched to the next aircraft in the line. Barring a few short outages with the lights, this format worked very well and things progressed smoothly and swiftly with the final aircraft shutting down about 90 minutes in advance of the advertised closing time; a window of time which allowed those who waited an opportunity to shoot both the Hurricane and Spitfire for a second time whilst other aircraft were put to bed, the marshalls permitting very close access to the warbirds that North Weald events have become renown for in recent times. The limited lighting, close proximity of the crowds to the aircraft and power outages have drawn a bit of criticism from some quarters, but in fairness it was a first attempt for Weald Aviation to organise an event like this and the ground crews were only too happy to talk to the punters and take on board their comments to learn lessons for any future events, which is to be commended. 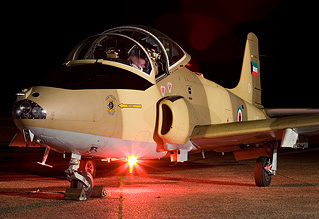 Under artificial lights at night, the aircraft aren't going anywhere anyway, so it's not like a blackout for a few seconds is going to cost you that photograph. At £20 a head, an event like this does look a bit pricey, but it's a niche market and the crowd numbers are significantly less than even a small open day at North Weald, let alone a fully fledged airshow, so the price per head goes up to cover the costs of the fuel and lighting bills. It wasn't perfect, but those running the event were keen to get feedback on the night and if the lessons learned can be applied for any future events, there should be a lot to look forward to. There are more than enough aircraft of interest at North Weald to sustain a series of varied events in the future.